I ran for the first time today in my Stroke Association vest: eight miles around Seaford, in a cool wind, but nowhere near as cold as it has been. I was pleased, as I had no knee pain, and I seem to have returned to the sort of weekly mileage I need for a half-marathon four weeks away. Other runs this week included a long one with the Striders on Wednesday, notable for my attempt to run through a chain-link fence - I didn’t see it in the dark and still have a bruise on my hand. And on Saturday night, it was the Seaford Striders awards evening, at which I was delighted to win a Sussex Grand Prix prize, given to all club members who run eight or more of the Grand Prix races, and the Jo Jo Gunne award, for running three races on three consecutive days at the August Bank Holiday weekend. 28 days till the Brighton Half. There was not much training this week, a family visit preventing anything but a short outing on Sunday. When I did finally run, I found it hard after a week’s lay-off, and it was only towards the end of a three and a half mile outing that fluency of some sort returned. Nevertheless, this week will be different. I’m not worried about a week off, at this stage. I can still build with a couple of long runs between now and half-marathon day, consistent effort on weekdays and, my secret weapon, abstinence from alcohol between next weekend and race day. 35 days till the Brighton Half. Week ten being at an end, that means there are six weeks to go. This week wasn’t a hard week, only three runs, two short ones round Seaford and today’s cross-country event at Ashdown Forest. A.A. Milne lived at Cotchford Farm, not far from the race starts, and the forest is supposed to be the setting for the Winnie the Pooh books. Certainly one can understand Eeyore’s melancholia, if he had to endure conditions like today’s. The mud was bottomless, and it rained, though not enough to shift the snow still lying on the ground. It was cold; I began to shiver the moment I left my car. The race was run clockwise, rather than counter-clockwise as in previous years. Whether this is any better or not, I find hard to say. I was slower than last year; unsurprising, probably. It must be said that my fellow Striders turned out in force, and when the results are out I think we shall we see some strong performances. In other news, my knee was reasonably well-behaved, though on the long ascent in the last stages, my back played up. I attribute this to attempts to do bridges. Indeed, this afternoon, I unwisely attempted a one-legged bridge. 42 days till the Brighton Half. A much better week, thanks to a bank holiday on Monday, so I could fit in an extra run, the Peacehaven Resolution Run, a dry-run for a Peacehaven #parkrun, which is in development. It was cold, and the north wind did blow, but there were some lovely views on a course on a mixture of path and grass. Some of the grassy sections were very boggy, although there hadn’t been much rain. According to my Garmin, the course was a little short of the necessary 5k, and some of the faster runners were misdirected near the finish. That’s the reason for trial runs like this, so I’m confident the organisers will make the necessary improvements. Today’s long run was seven miles along Seaford front, to the end of Newhaven East Pier and back. I haven’t run this far since early November. My knee held up well. I’ll be increasing the distance of the long runs between now and a couple of weeks before half-marathon day, when I’ll start my taper. 49 days till the Brighton Half. Week eight of sixteen weeks means I’m half-way through. Broadly speaking, I’m pleased with the way things have gone. I need to start covering longer distances, but I’ve wisely taken it easy with the knee. From now on, Sunday long runs start to become long. 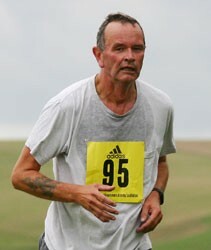 I’ve also had some useful advice about fartlek surges, which I intend to apply. 56 days till the Brighton Half.